Undefeated UFC heavyweight fighter – Matt Mitrione – will soon face the toughest challenge of his young MMA career, as he is slated to meet Cheick Kongo at next month’s UFC 137 in Las Vegas. However, he is not intimidated with the veteran at the very least. In fact, Matt Mitrione stated that challenges like Cheick Kongo are exactly what drew him to the sports in the first place. And a win over the veteran would give him exactly what he’s seeking — job opportunity. Matt Mitrione started his UFC career in The Ultimate Fighter 10. His behavior on Spike TV series suggested that he wasn’t long for the sports. However, he transformed into a fan-favorite – with his skills developing along with his persona – over the past years. Now, Matt Mitrione will face a more seasoned and more experienced fighter in Cheick Kongo — the type of opponent that he exactly wants. “[Kongo’s comeback win] was phenomenal. It was great. Cheick Kongo, his chin is whatever it is, but he’s resilient as hell. He doesn’t get knocked out easily. When he got yoked by Frank Mir, he actually took Frank Mir down and tried to wrestle Frank Mir. The biggest question now revolves around the experience of the two fighters. 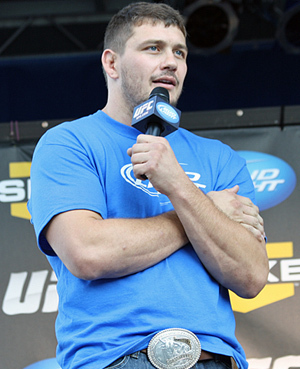 While Cheick Kongo carries a 26-6-2 record, Matt Mitrione only have a total of five career fights. However, the latter believes that the winner at UFC 137 will be ultimately decided by how many of their career lessons can be applied within a 15-minute time frame — and if his own athleticism can help make any potential gap. While UFC 137’s main card is garnering the headlines, the Matt Mitrione vs Cheick Kongo match could provide some fireworks.